A Mercedes-Benz dealer has defied the Motor Ombudsman by refusing to accept any decision it may make that a customer is entitled to reject a car over a fundamental fault. Dr L Southee was one of the first to complain of a front tyre 'crabbing' issue on her new Mercedes Benz GLC Coupe purchased in November 2016. 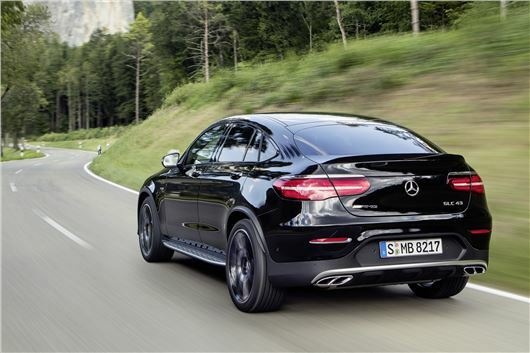 When lock is applied to the steering of RHD GLCs, GLC Coupes and C43 AMGs, the front tyres fold over and skid, as if the geometry of the steering is incorrect. She informed the dealer about this the day after delivery. LS was directed by Mercedes-Benz to the Motor Ombudsman, who ruled that she may be entitled to reject her GLC Coupe for a full refund. She finally returned it to the dealer on 12-1-2017, following the correct procedure, with letters quoting the Consumer Rights Act 2015, etc. The dealer would not accept this, saying he will not refund her and will not agree with the Ombudsman telling her she may be entitled to a refund, nor does he agree with her interpretation of consumer law. The Motor Ombudsman told LS she must go through them first (which she has), as any court would look more favourably on the case if you have tried all other means of resolving the matter before litigation. She totally disagrees that it isn't a safety issue. A tyre that is being overtly deformed to the point it folds in on itself will lead to premature failure of the tyre. The dealer refuses to inspect the vehicle, or check the alignment and unlike other owners, will not offer winter tyres. We are happy to allow other owners of RHD GLCs, GLC Coupes and C43 AMGs to get together in the thread beneath and take a Class Action against Mercedes-Benz UK for supplying cars that are manifestly "not of satisfactory standard". This may also set a case precedent for the Consumer Rights Act that came into effect in November 2015. Wow. A dealership refusing to accept the decision of the Ombudsman, even though they're obliged to ? I see this getting VERY messy. Add me onto the class action list with my unsatisfactory GLC 43 which my dealer refuses to accept has a problem. Mercedes need to sort this issue out now as they have a whole load of very unhappy customers and we will not be fobbed off. We are happy to join in as we are not getting anywhere with the dealer/Mercedes UK. Mercedes GLC43 AMG, took deliver on 9th November and reported the issue first on 11 November during the sales followup call. Has anything progressed with this? I'm happy that the lady in question at least has the ombudsman on her side. However she certainly isn't one of the first to complain. I mentioned the issue to my dealer in December 2015, car was lifted for checking in Jan 2016. Got a call that evening to say that they could hear/feel the issue. They tried a stock GLC and it did the same, said it was actually a bit worse, might be because it was on 19". Tech guy said it was the nature of 4x4 and to do with how the differiential operated. I took them at their word, however it appears this answer may not actually be accurate. It certainly is disconcerting. I was not aware of exactly what was causing the clonking. To here that the tyre is possibly being stressed in ways that it was never designed for, is worrying. It is true to say that it is much worse in colder termps, like now, but the issue still occured to a lesser extend throughout the year. Thats unbelievable. We would be up for joining in a class action against Mercedes as we are also not getting anywhere at present with the dealer, just being fobbed off with 'Winter Tyres' and it being ' a characteristic of the car' etc etc. Count me in also. GLC43 owner since July. GLC 250 owner since Sept 2016. Please include me. Mercedes GLC43 AMG since December 2016. I have all the symptoms of the conversation. I'm a solicitor at a firm in the Midlands (www.georgegreen.co.uk/site/people/profile/jfield). Part of my background is in advising on the enforceability of Ombudsman decisions and also motoring related litigation. I would be very happy to discuss a potential claim with affected owners. Please feel free to contact me at jfield@georgegreen.co.uk to arrange a time to discuss the case. Sign me up also. Owned a GLC43 AMG since October 2016 and car has all of the same symptoms. I have taken it back to dealership and been given the same 'winter tyres' solution. Please include me in any action. Add me too, have a 250d on 20" since October with all the same issues you have described. I'm in too, I bought my glc coupe back in November and after a long battle with a rude MB customer service assistant, I was told to put winter tyres on my car or take the issue to the Motor Ombudsman. I can't begin to explain how angry I feel right now. I've been watching honest John and mbclub forums hoping that somehow a miracle would happen and MB will agree to fix this is but this news just made me sad. Anyone thinking of buying a glc, please watch Jean Paul and Tony Mac videos and you will see how stressful this issue is. Add me too, I've had a C43 AMG 4matic, September 2016. We have all the symptoms as mentioned above. I am currently within the first 30 days of ownership of a GLC43, and am also receiving the constant inaccurate line from Mercedes. Whilst I have not yet confirmed my decision to reject the vehicle (I am awaiting a Dekra report) and so it may/may not be accepted by the Dealer - but by the sound of it I will not get the desired outcome and so would be happy to join the class action suit at that point. I'd park the car over his main entrance with placards and balloons on it. Might just focus his attention on compliance - and that of potential customers who may just decide to drive on. Bit of social media exposure might help too. Seriously, is there some arrogance inbred in German manufacturers and their UK dealers? VW Group is ignoring compensation claims over dieselgate, head in sand over DSG failures, EGR failures, ABS failures. I dont find this 'sorry mate, you're on your own' stance covers the Teutonic car companies in glory. We're in too. Told dealership of the problem in Nov, when I took it in they did not examine it just said get winter tyres. Spoke to Ombudsman only yesterday who directed us to Dekra. They are due to examine car next week after dealer only today refused to accept our request to reject the car. It's a 250dwith 20" wheels. I'm. In. GLC43. Owned since July 2016 and it rattles and squeaks like a 70's Vauxhall. I now wonder if this has been exacerbated by the crabbing and knocking I also get and have done since the summer when turning on full lock. My salesman has been great at Robinsons Mercedes of Peterborough but the management there never return my calls or emails when promised and I have been unable to get a face to face with them. I've lost some love for the car. It's not premium and it's not right. MB dealer has looked at the car and said we need to purchase winter tyres to fix it, even though the juddering, bouncing and clonking has been very noticeable since Sept. They suggested running the car all year round on winter tyres - what? I cannot believe MB are telling us that our almost £50k GLC is safe but will be uncomfortable to drive, which they call a 'characteristic', and expect us to not ask for a fix - disgraceful customer service! Same issue with ours since day one had it 6 months and merc dealers are terrible at customer service in our experience surrounding this same tyre issue. Please include me. The car is fantastic except for the steering. Customer service is very poor. GLC43 since October 2016, same issues as above. Please include me. Bought our GLC Coupe 250d 4matic 20 inch wheels on the 30th November and have the same infuriating problem.We would like to be included in the group for possible litigation towards Mercedes. Picked up 250d Sport today & found steering strange, oversteer when turning & feeling unstable, will certainly be reporting to Dealer. I'd consider joining any class action if not resolved . I've always wanted to own a Merc, fortunately my wife put me off on financial grounds! Seems to be a case of poorly designed / manufactured rhd conversion. Also though, it is yet another very poor reflection on UK consumer law. This particular problem does not appear to affect cars in the USA because they are left hand drive but any common and alarming fault with safety implications would soon be picked up by the the road transport agencies there. Have any of you contacted you MP ? Ultimately parliament controls our consumer legislation. Questions being asked in parliament often have a sobering effect on offenders and whilst it is no quick fix, things need to change or our grandkids will still be getting the runaround from these people in decades to come. Another unhappy buyer .Just taken delivery of a GLC 250 d with the same clunking/crabbing issues. Does seem much worse the colder the weather , as seems to be borne out by the large number of recent complaints.Did some quiet hard full lock cornering in an empty station car park in 3 deg c , wet conditions and the car barely followed the steering direction.Lots of clunking and crabbing with massive understeer.Clearly this cause long term damage / premature wear to differential / gear box and tyres .Also potentially dangerous . Will try for a refund from Lookers Mercedes on Monday but don't hold out much hope .Please add me to any class action . Quite a lot of 4 wheel drives have done this over the years, even some 2 wheel drives. Dont shoot me and i am not saying it is an ideal solution but i think it should work. The steering geometry keels the wheels over over at full lock and the front ones fight against each other, I feel sure that the problem could be solved cheaply and without the Legal Proffession making a killing by retro fitting extra Lock Stops on a recall, only downside would be that you then may have to make a 4 point turn where it used to only take 3. I had no idea how many people are in the same predicament, especially as some of the comments on the MB UK FB page say it's only a few cars affected! Shouldn't be any at all. I've just watched Jean-Paul's GLC43 YouTube video of his vehicle's symptoms. That car sounds particularly awful and I would be alarmed if Mercedes-Benz thought that was 'normal' or acceptable. Even if it was a "characteristic" of the car and was deemed safe, it would be difficult for any consumer to have complete confidence in a passenger car that practically played the drums every time the steering wheel was used. I bought a GLC250d (with 20" alloys which came equipped with Pirelli Skorpion All season tyres) last September. I experience an occasional clonking from the front end... mostly when hard lock reversing (very rarely going forward)... particularly in the wet or damp conditions... and mostly first thing in the morning (where the ambient temperature's lower). Nothing nearly as bad as J-P's car though. For that, I'm inclined to agree with Mercedes' recommendation that switching to an 'all-season' or 'winter' tyre will likely alleviate the issue. However, based on my own experience, it won't totally eliminate the problem. From a technical standpoint, I'm not entirely surprised the front end behaves like that when you consider that the steering geometry is set up for relatively tight turning circles (agree with Barrie Crampton's solution on this)... on an all-wheel drive chassis... with the front driven wheels wearing low profile 'summer compound' tyres... performing on damp surfaces. You're bound to get some undesirable kickback. I've recently driven a few friend's various all-wheel drive vehicles with similar (summer) tyres in similar (damp) conditions which display similar traits (an Audi Q5 Quattro, Porsche Cayenne and a BMW X4). Conclusion? It does appear to be modern-day (German car?) 'four-by-four' chassis behaviour. My key response would be, why my GL class doesn't do this? It is also on 21" wheels, same turning out of my drive way and roads. And even same Continental tyres. Why doesn't my VW Golf R does it? Why doesn't my neighbours Hyundai do it? Why doesn't my other neighbours Jaguar F-Pace Supercharged do it? Why doesn't my neightbours Range Rover Vogue/Sport do it. Etc. it really shouldn't be doing this. There is no need for it. To me it reminds me of my 'less sophisticated' vehicles with manual 4x4 and manual locking diffs. If when towing my boat out of the water in the pickup truck I forget to unlock high gearing the diffs/gearbox winds up. The feeling it gives is exactly like this car does. Likewise the car doesn't want to corner. This issue is way too much. And yes the turning circle could be reduced and that would stop it, but not really it would just prevent it from happening. It would be daft for the GLC to get a worse turning circle than a big GL class which can take such corners without crabbing. Or the ML that doesn't do it either. And actually the A 4matic like in the A45 doesn't do it either. I'm a buyer who was just about to purchase a GLC when I picked up on this horror story. I've had four Audi Q5's and they have never shown any sign of this trait whatsoever. MB should appreciate there are many potential buyers who are simply waiting for this issue to be resolved before they commit. Count me in I am currently awaiting the decision of the Ombudsman. Count us in 220GLC ?? Count me in.. Picked up my GLC 43AMG in Nov 2016.. it does this too.. and I don't buy the crap story that all 4x4s do this. My 2 previous MLs did not do this on 21" alloys. I have gone back and forth with MB Cust Service when they kept advising that winter tyres are required.. my ML's user manual said the same thing but it did not suffer from it..
Count me in. GLC 220d AMG Line, bought in July '16. Has been doing this from day 1. I have a meeting with the dealership on the 27th of Jan. Let's see what they have to say about this. Reading about this issue, I do not expect a lot from them. Yes count me in too. Had GLC 250 AMG line since Nov 2016 and the problems with the steering since then too. Dealer un-sympathetic and said unlikely to get support from Mercedes. I'm currently recording the outside temperature every time the issue occurs, as they seem to disbelieve my reports that the juddering occurs in the summer too. One of my biggest concerns, aside from safety, is the impact this problem will have on the resale value of the vehicle. I am so disappointed with this car. New C43 picked up late Nov 2016. Never noticed the issue on test drives....experienced it the first night I parked up. Had the car checked at local tyre fitters 2 days after and was already showing abnormal outer wear on front tyres. Dealers have also just said its a typical characteristic of the model. I've stated that I think its dangerous, as the car can skip sideways between 6 - 12 inches on full lock and parking speeds, which has almost resulted in hitting parked cars! I have a 2013 C250 AMG sport estate and was going to purchase the C43 AMG 4 matic estate, a car we have been waiting a year for, at the end of Feb. We are not going to do that now! I cannot believe that MB could know of this inherent problem and continue to sell this car to me. I am livid, I only hope that the Ombudsman can resolve this quickly for all you that have parted with good money! I will not buy MB ever again. Have we got access to any reputable motor manufacturers any more, problems with MB, VAG, Porsche etc etc? I have the GLC AMG 220 with 20" tyres and mine is as bad as the rest . I'm gutted that the car is so bad, I waited for 8. Weeks for the vehicle and I wish I would have rejected it because of the time scale, first and last time I will buy a Mercedes the way I am being treated by dealer and Mercedes UK . I'm putting mine up for sale and cutting my loses as I can't afford my wife and family to have an accident after the tyres fail on a motorway. Don't trust the vehicle one little bit . GLC 220 AMG line with 20 inch wheels. Mercedes should be ashamed of themselves. The best or cabbing - is more appropriate as their tag line. Don't accept it guys. This should NOT happen on any car never mind a £50,000 one! We bought a GLC 250 4matic in April 2016 and have now received a refund. We threatened Mercedes with litigation and they buckled when they saw our video. youtu.be/VTT0U8fciR0 Don't accept it guys. This should NOT happen on any car never mind a £50,000 one! Superb well done! How recently did they refund and did you have to reject the car and leave it with them? Did you threaten the dealer or MBUK? And who was your dealer. Thx. C43 since September! Would be interested in this as it spoils an otherwise great car! Has anybody notified BBCs Watchdog? They love a car story. I will be watching this thread with interest. "As per the Mercedes-Benz digital handbook for your car, we would always recommend the use of winter tyres for temperatures below a certain point. The recommendation given to improve this characteristic would be to change the tyres on your car to suitable tyres for the winter period. Please note this characteristic may be seen at other ambient temperatures due to variant factors relating to the temperature of the environment, the tyre wear and the length of time the vehicle has been left unused." Apologies if this has already been posted, but "please note the characteristic may be seen at other ambient temperatures" and the recommendation is winter tyres! This is a laughable response, which, as far as I've seen from others, is an addition to the advice which has been given previously. The response from MB also states the usual; "it is a characteristic of this type of vehicle".... what type of vehicle is that(!? ), as it's also happening on the C43 and now E43 (and perhaps others). In other words there is a design issue within their 4matic system somewhere (the differential setup perhaps). I cannot believe they continue to bury their hands in the sand over this! I have also noted on social media (a GLC specific thread) that MB have advised there are ongoing technical investigations in the U.K. to try to minimise the characteristic. I've not heard this from any dealerships and wondered if anyone else had? Please count me 100% in with regard to the class action suit against Mercedes-Benz. I just posted the previous comment and realised I didn't have a profile name. Just in case, please count me in for the class-action suit! Mercedes E43 AMG PistonHeads review, noting the issue exists in this car also; "As in the C-Class though there seems to be some clunkiness in the application of the system. In the C43 we noticed some chuntering on full lock and at low speeds, such as pulling out of parking spaces. In the E43 it's arguably even more noticeable, the front wheels 'skipping' as if there's some transmission wind or a locked diff somewhere in the system. Interestingly the Porsche Panamera 4 S we've got in at the moment does the same thing, albeit to a lesser extent and Mercedes is promising to get back to us since raising the issue. If the E43 had the E63's Drift Mode we could have disengaged the AWD system to see if that's the root cause but, sadly, there isn't the option. Maybe AMG could add it as a 'Parking Mode' instead!" They also note the following; "So you get an AMG specific 31:69 front to rear torque split for the 4Matic four-wheel drive system, now available on right-hand drive models by virtue of being a standalone module added to the 9G-Tronic gearbox rather than integrated into the casing as it was on the previous seven-speed. This apparently gives AMG greater scope for tuning the system to suit the car and market. Indeed, for non-AMG 4Matics sold elsewhere the split is 44:55, like many of its type the system essentially adding a transfer case and front propshaft to an intrinsically rear-wheel drive layout and bleeding off torque to the front wheels when needed. The aim of course is to keep the characteristic rear-driven balance customers are used to but with all weather traction and less of the implied 'scariness' of traditional rear-wheel drive." My GLC250d on 20" Pirelli Skorpion tyres - now that the weather is colder - has started doing this crabbing with most low speed forward turning manoeuvres (whereas before it was largely doing this wheel skipping/dragging in reverse). My wife has driven it and used Park Assist recently and said it did it several times whilst it was parking itself... and that it made such at clonk at one point that she "thought the car had literally kerbed its own alloy". We've got our local dealership looking at the car next week (primarily for other issues such as the boot opening itself at random and the Mercedes Me app that - given the information it often displays - must be for a completely different Mercedes) and I've spoken to them on the phone about this crabbing problem. I've asked that while they're examining the car, they might want to check wheel alignment across all steering angles just in case the car is wildly out. They replied that they are aware of the 'low speed vibration' issue across certain 4 MATIC models in their range (It's a popular complaint with the A45 AMG apparently) but that Mercedes in Germany have 'no solution as of yet'... (well... that's not to say that any of us believe that Mercedes are actually looking into it... but at least the dealership didn't try and sell me winter tyres). They then seemed quite happy to discuss possible - albeit speculative - solutions that could cure the problem such as a tweak to steering geometry, camber and toe angles but they all sound like fairly major re-engineering solutions that don't sound particularly retrofit-able nor the subject of a simple recall. In any case, I'll keep you updated on their findings. Have just found this thread and not too sure how to add comments but here goes. My GLC 220D Sport with Off road pack on 18in wheels with Hankook tyres started this clonking, crabbing within a few weeks of collecting the car on 1st Sept 2016. Bang goes Mercedes claim for the winter tyre solution! I did report it to the Dealer by email but on discussion I wanted to be able to reproduce the circumstances to demonstrate to them. This clonking/crabbing mainly seems to happen on full lock into my drive and only occasionally in car parks again on full lock. I have been distracted this past few months so haven't yet discussed fully with the dealer. It does appear that the "bigger tyres" do tend to mask the problem but I suspect it is still there. "The GLC handles with all the precision and composure you expect from a Mercedes-Benz. Even in challenging driving conditions, 4MATIC permanent all-wheel drive is on hand to optimise traction and ensure superb response. The system has even been specially tuned for right-hand drive vehicles, with a 39:61 torque distribution between front and rear axles to enhance driving enjoyment and control." I will share any developments when I discuss this with the dealership and am quite happy to add my name to any class action. Let us hope the threat will be enough for Mercedes to extract the digit and find a solution. My wife has a C43, same issue and some more. The geometry is out according to my local hunter machine. I have reported this and more, AMG customer services have arranged for geo check at the dealer, the passenger seat to be fixed as the stitching is coming undone, a rattle in the back, the boot mechanism sticks. Some some easy stuff to fix, driving behind the car today it looks like it's crabbing a little. We planned on keeping the car for a good few years buying it new, so we have purchased some winter wheels and tyres, so tomorrow morning it d day! If it Judders tomorrow it's going in for a full refund. If I have to stay there all week! Well the Michelin winters on a set of oz racing leggara wheels has stopped the issue. I'm not sure that's a good thing, but the car feels much better. Also the same issue with my A45 AMG that I bought in Sept. being told to put winter tyres on it. Worst experience thus far trying to get this issue resolved with Mercedes. Count me in! I have had the same problem and took it to Lookers in Tonbridge who told me to ring Mercedes customer support. They in turn told me to buy some winter tyres. I would be happy to join any legal action against them if they don't fix it, give me a refund or at least pay for some winter tyres and the cost of changing them each year. Has anyone had problems with the sat nav? When you ask it give directions it speaks gibberish and cannot pronounce any names. #it was even worse in France. Recently Slough came out as Sluff and Chiswick was Chis Wick. Very second rate stuff compared to my previous 2010 E class which worked well. I have top of the range options for all this stuff and spent £45K on this car. I've a GLC 220 Sport on order for March. If it manifests any sign of this problem I'll be adding to this list. MB should realise that numbers will only grow unless a fix is found. I bought a GLC220 AMG (with option of 20in wheels) back in October. Exactly the same issue at near or full lock. I complained to both dealer and Mercedes UK and was given the standard response that it is a "characteristic of the car and is not dangerous". I was advised to fit (at my own cost) winter tyres. I've reluctantly fitted the winter tyres (not cheap!) which I really feel I shouldn't have to do. The temperatures where I live in South Wales are rarely below 7 degrees for any length of time. It's clearly a design fault, and the sooner Mercedes hold their hands up to this, find a fix and organise a recall the better. What will this do to potential resale values in years to come? The handling of this from my local South Wales dealer and Mercedes UK is really leaving a very bad taste in the mouth. This will almost certainly be the last Mercedes I buy. I have already advised many friends and colleagues of the story and they are quite shocked at the situation. I also have a GLC 220d 4matic which has the problem with juddering and thumping of the tyres and would be willing to join any joint action which may be undertaken. Two visits to my local MB dealer have done nothing to alleviate the problem. They have stated that until MB accept any liability then they can do nothing. I have owned several MB over the years including a 4x4 which have never had any problems. Only yesterday my dealer told me that MB were taking action against the honestjohn Webb site to have all the comments removed. Count me in too. Took delivery of a GLC 43 on 31st October 2016z. Notified dealer next day and was told it's a normal characteristic of the vehicle which I do not buy. It's ridiculous that a car of that value behaves in such a way. It's going in to MB this week but I'm not holding my breath. I will also be in touch with the ombudsman and will go to watchdog too. We all need to do this. It's pathetic how MB think they can get away with this. I would like to add myself to the list if unhappy Mercedes GLC owners. Took delivery in Dec 2016. Will be interesting to see how this all turns out. I have the same issue told its a characteristic of the car, the dealer will not do anything at all. I would be happy to join and give my comments on this its awful and very unsettling. My service dealer said its my opinion and not theirs, I tried to tell them that paying 4o plus k for the car new its my opinion that the issue is a defect in design not a characteristic. I have exactly the same issue. I cancelled my GLC order in favour of an F-Pace based on this issue. I wish all of you the best of luck though - shameful behavior by MB! When you cancelled your order did you lose your deposit? what did you say to the dealer, I'm thinking of doing the same. And another - happy to join the fight with MB. GLC250d sport on standard 18" wheels (delivered in December) with the crabbing issue. This is completely unacceptable on a car costing £40k plus. The BMW X3 we had previously did not have this issue. MB advising that the owners guide advises to fit winter tyres is pathetic. Why would you look at an owners guide before buying a car, and should you be expected to study a book of several hundred pages before making a decision to purchase? I think not. 18" wheels on summer tyres is supposed to be one of the fixes according to the MB statement so what do they suggest for you? Happy to join legal action group. I have the same problem with my GLC clunking/juddering /jumping. GLC43 owner with the same issues. Happy to join any action. Just need someone to lead the fight. If everyone continues to contact Watchdog, MB will start to sit up and take notice once a barrage of bad publicity is imminent. Watchdog are always interested in car issues. I contacted Watchdog the other day but not had a response yet but the more that do I guess they will take notice. Frankly, never having been in situation like this before, I guess most of us will not know how to go about taking on MB but it's clear that there is a determination to not let them get away with it. If only one owner is successful in taking legal action then surely that will set a precedent and force MB to do something. I think dealers recommending winter tyres is getting people's backs up to be quite honest, as it's an insult to the intelligence. Was also told to put winter tyres on at a cost of over 3K but none in stock for over 6 weeks?? I too wish to add my name to any action over this issue. All other aspects of my C43 4matic are great, but this fault is unacceptable and makes parking difficult and embarassing. Add my name to any action. Car unsafe to use parking system. GLC 220 Sport. Add my name to any action taken over this. Have to say, I really like the GLC and the people at my local Mercedes-Benz dealership... but this 'wheel skip' just isn't acceptable. Two years to decide to look at the problem - come on Mercedes!! I have a GLC 220 Sport Off-road and have had the same problem,which occurred within a few months of taking ownership. This was in June last year. MB suggested putting on winter tyres below 7degrees but mine was juddering in the summer going over a wet surface and in a supermarket carpark that had been coated with paint! Not just a winter issue. After several correspondence with MB ive contacted the Ombudsman last week. I have bought 3 MB vehicles over the last 18 months and this will be my last. Any class action count me in. Comes to something when you can't manoeuvre safely out of a car park without hitting a wall or pedestrian! Whats is happening with Mercedes? Took my car in yesterday for check with dealer and handed letter from Mercedes like a lot of us who contacted Mercedes telling us to put winter tyres on not a chance so does that mean that Mercedes admit this a fault or as they say a characteristic this means in the dictionary " a feature " I cant remember this being a feature I was told about when I bought the car . Have logged my complaint with MB UK today and they said that engineers in the UK are looking at this problem but MB customer service were very guarded in the information they gave me. I own a Glc 250d amg and have been in contact with my local dealer several times and also contacted watchdog, I suggest everyone else does this as well as this may pursued them to investigate. On anther note I have been contacted by my local dealer and they are going to try fitting hybrid tyres to the car after consulting there tyre suppliers, I will report back on the results. A website has launched to aid those owners affected to group together and collate securely information. It would be good when those affected register to aid communication across the various online communities. Hi, I've had this issue since recieving my car in April, Mercedes have continued to ignore the problem. garage keep saying nothing found and head office are just a joke. This is a safety issue as the tyres lose traction and slip, even when not at full lock on some surfaces. Last week I had an accident, turning sharp left at low speed, tyres slipped/crabbed, I ended up in a wall! I too have the same issue in Guernsey, Channel Islands. I am currently in conversation with my local dealer. I believe I am at least the third local customer to feel completely dissatisfied with my car. The frustration lies in the deterioration of my car in just two months from ownership coupled with the nationwide PR that is emerging that Mercedes appear to be completely ignoring. Applying winter tyres does not correspond with the car that I purchased in good faith from my dealer. I have now had an opportunity to talk to tyre experts and search the internet and the consensus of opinion would be that to fit winter tyres to my Mercedes GLC43AMG would be at the detriment of the car - which was bought as a performance vehicle. As this has been suggested by Mercedes where is the full detailed research as to how the car handles and runs on winter tyres coupled with reports of how the fuel consumption will be affected? I do not buy a new car without thorough statistics so why would I be forced to accept modifications to my new car without proven merit? I did not purchase a car on winter tyres nor should I have to take the risk of using them in summer conditions both in Guernsey and further afield. They are potentially dangerous. I do not restrict my cars to Guernsey usage and drive them throughout Europe in the summer months. For instance, last summer I did a 7,500 mile european road trip in 35+ degrees. Unfortunately, using snow tires year round isn’t recommended. In the long run, it will cost more money than changing them out and could compromise your vehicle’s performance on the road. 'Summer tyres guarantee the maximum safety performance during summer either on dry and wet roads. As an illustration, breaking from 80 to 0 kph between 11 to 26°C, on wet roads will take 4m shorter with summer tyres than with winter tyres. On dry road, braking from 50 to 0 kph under the same temperature condition will take 1.5m shorter with summer tyres than with winter tyre’. Quite simply only two months in, my car is not the car I was sold by my dealer nor is it ‘fit for my purpose’ to chauffeur my clients without great embarrassment. By adding winter tyres will be adding insult to injury and a potential risk to my personal safety. Please add me in. GLC bought last March. Asked by MB to take in to dealer as they have "some ideas that could rectify this ". Returned today by dealer with the same advice re winter tyres etc. Laughably, MB line from customer service today was that this is mentioned as a possibility in the owners manual - why would you look for it? / car already bought by then. I am astonished that MB are doing nothing whilst heading for a major PR/ reputational disaster. Please add me as well. Own a GLC43 AMG Jan17. Didn't realise how many were effected thought was just going to be a bad batch of us. Surely a recall must be on the cards! To be fair my dealership has been very helpful, offered me a full refund. Still a few other options to try first but worst case will get my money back. If you have been offered a full refund why don't you take that and run, instead of hoping for a recall? Not sure how long that offer will remain so I would take that promptly if I was you. Do you mind if I ask what dealership you are dealing with? Please add me as well. Own a GLC43 AMG Jan17. Didn't realise how many were effected thought was just going to be a bad batch of us. Surely a recall must be on the cards! To be fair my dealership has been very helpful, offered me a full refund. Still a few other options to try first but worst case will get my money back. I would take that refund instantly - just save your self the annoyance and forget about this vehicle. If it is confirmed to be fixed you can always order another one. The dealers are powerless in this as they are being fed the same rubbish from MB as the rest of us. MB can sit on this for as long as they want. They are still selling cars and must have dozens of customer service advisors who can keep batting away our complaints. Please add me in as well , had a GLC since last April and have all the same symtoms as mentioned by others here . Definitely count me in too. I should be taking delivery in a couple of weeks of my GLC 220d sport coupe, very concerned about the current information i can see around the www, but if MB are not stepping up to the bar on addressing the issue we all must join together to show just how big the problem is. The link above is for reporting to Watchdog, i would suggest everyone one of use sends in our experiences. i would hope that WD would see that taking on the mighty MB would be a great audience puller...! 1. The GLC I planned to buy comes with 18" wheels. Does this issue affect 18" wheels too or the AMG line only ? I saw youtube videos of the crabbing and noticed the cars had very low-pro tires. 2. I live in HK which is very hot most of the year ( between 20 to 35 degrees C ) with perhaps one or two weeks in the low 10's. Does this issue only occur in low temps ? Would it occur above 20 Deg C ? 5. In one video I saw, there was very bad tire wear on the front wheels. Is this a common occurence ? Can it be corrected/lessened by alignment ? All sizes are affected, the stats collected on www.mercedescrabbing.org demonstrate that the 21" is in the minority. We have collated reports from 17-21" and everything inbetween. I'm not aware of any GLC owners that do not have this issue, I am aware of some who say they are not bothered by it. It is absolutely shocking behaviour of Mercedes and quite unbelievable how they continue to fob us off. Please do make yourself known at www.mercedescrabbing.org if you haven't already. We collect some surveys, and are coordinating direct action at the moment. I know this has been said before in many threads but the www.mercedescrabbing.org/ is a one stop shop to collate every owner's experiences and JP is doing us all a great service in taking the time to run this site and present the information and surveys directly to MBUK. As you said the latest campaign, live since this morning is; Dear Garry Savage, there is something you need to know. Directly aimed at the CEO of Mercedes UK. Posts are starting to flood in from owners, and the page is beginning to build nicely. Only registered and verified users will have access to a form that will make a post automatically on that page. So if you aren't registered yet, please do register and make your voice heard. I own a 250D Premium Plus (Sep 16) Sport with air suspension and the off road package. It has 18ins wheels. The car has now done 5K miles and I voluntarily fitted winter tyres at the beginning of December - as I always do. Both before and since I fitted winter tyres I have had no juddering/crabbing when at full lock despite the fact that I have to manoeuvre to get into my garage and despite the fact that there was a cold spell before I fitted the winter tyres. I am not sure if the air suspension makes a difference but clearly this problem does not appear to effect all cars. I received my new GLC 250D AMG Line Premium Plus Coupe two weeks ago, it was a pre spec'd vehicle that came with 20" wheels and MO standard tyres. I noticed a noise like the front tyres slipping when in a tight lock situations, I assume this is the crabbing being referred to. Listers Mercedes in Lincoln had told me that MO are run flat which I assumed was true being new to Mercedes. To cut a long story short I found out Listers were wrong, they offered to fit MOE run flats free of charge but couldn't as MOE aren't available for the 285 rear tyres so I persuaded them to swap my 20" wheels for standard 19" with run flats fitted and £595 refund for the 20" upgrade which they agreed to. With the 19" run flats fitted the noise has gone which proves the point that the design of the GLC Coupe is having an affect on standard tyres during full lock manoeuvres which isn't evident on run flats because the walls are much thicker and less prone to distortion, though it could result in accelerated wear on run flats. One thing that no one has mentioned is the use of park assist. My C43 crabs badly coming off my driveway, which requires full lock at low speed, as well as during most low speed / extensive lock turns (19" wheels with Dunlop Sportmaxx); however, parallel parking using park assist, it doesn't, and it uses a lot of lock in both directions. Please add me to this ever increasing list of unhappy owners of the GLC. I picked mine up from Chester on 30th Sept 2016 after a 10 week wait. Noticed this fault the next day and thought the tyres were low. Checked these and they were ok as expected. Rang the dealer and got put through to one of the technicians, he said the steering issue was fine, try going slower on full lock and don't worry about it, I told him this was not the answer and if I needed tyres in a few months time then I would not be paying for them. At the moment I make the same turn everyday reversing off my drive and I have noticed a pattern starting to form in the tarmac with a few loose stones, this is definitely from my cars wheels. Really cannot see were this situation is going for us as owners, struggling to find why no motoring organisation, ombudsman, trading standards etc etc are willing to take Mercedes on over this, you only have to look at this forum , we are not all lying Mercedes!!!! Doris & Boris... My GLC250d AMG Line (with 20" wheels and Pirelli Skorpion Verde tyres) skips even when using park assist. In fact, there was one occasion where I used park assist... and as it clonked its way into the parking space, it finished its manoeuvre with such an aggressive skip that it felt like the car had kerbed its own alloy! It hadn't, but such was the sensation from within the car. I hope Mercedes come up with a suitable fix for this soon. It's such a shame as I really like every other aspect of this car. I've a deposit down on a 250d amg line with 20inch alloys for march delivery and having read these alarmingly numerous crabbing issues experiences I took the exact model for a second test drive today just to test for the judderring on full lock. After 20 minutes of turning both driving forwards and reversing at slow speeds there was no juddering that I could notice. The car was fitted with Pirelli scorpions, conditions were damp and mildish at 10 Celsius. However I feel nervous about my order now especially as the dealer asked me to sign a document essentially notifying me of the crabbing issue reports and that I was agreeing to proceed with the purchase regardless. As a GLC (250D AMGline) owner since Nov'15 I would say that I love my car, I hate the crabbing issue with a passion and I have been fighting it with my dealership on and off since the day I bought it but I cannot get away from the fact that it is the most comfortable car I have ever owned (and there have been a lot), it eats up the miles without drinking the fuel and it is genuinely still a joy to drive. I have to believe that MB will finally resolve this geometry issue with the weight and pressure that is on them right now and that the courtesy all-season tyres is merely a stop-gap. HI Johnathan wow" a GLC owner that is sort of happy with this issue . So, I have just had an interesting call from Mercedes UK stating that they have accepted that the crabbing is not acceptable and that nationally they have been given the go ahead by MB Germany for all GLCs to be fitted with all season tyres as a recall. I was grateful but hesitant given that others on this thread have said that this only showed marginal improvement and I did put that to them on the phone. They said that for all rims 20" and under (noting that 21" is still being worked on in Germany) this is known to fix the 'characteristic' permanently. I have had my 250D since November 2015 and the crabbing has destroyed the outer edges of my fronts so I am certainly no worse off by taking the offer. I have been contacted today by Mercedes UK with the offer of all season tyres (when they have them in stock!!) and was told that this will 99% fix the issue. Does anyone have an opinion on the disadvantages of using the freely offered all-season tyres? I mean in terms of performance, feel, fuel economy etc? I am by far not an expert and interested in what other people think. This is not a fix: and why should we be dictated to on which tyres we should or shoud not use after spending are hard earned cash on this faulty product I do think this is a stalling tactic while MB come up with maybe a proper fix. I insidendally have rejected mine after only 17 stressfull days. I too have been offered free All Season tyres but have decided that rejection of the car is the only route. There is no guarantee that the tyres will resolve what is clearly a design fault. What is more annoying is that MB are still referring to this as a comfort issue rather than a fault. Last night in a temperature of 4.5 degrees the car was slipping all over the place when making sharp turn. I have an A class A250 4matic and have. this problem occasionally and yes it seems more prevelant in colder temps. Just tried it and it happened in 9 degC. Are there any other A class owners out ther with this problem? I have had this fault since November 2015 and all through the summer, even in Spain and 35degree temperatures. This problem is why they didn't release the GLK in RHD format, the MB engineers have been forced to come up with a solution to allow MB to market a RHD vehicle into the lucrative mid size premium SUV market. I believe that the transfer box and front differential have been slimmed down and is smaller and only has a single set of planetary gears unlike the LHD versions with 2 sets. This is what is causing the lock ups in the front wheels. If the car is lifted on a 2 post ramp and you put the car into drive you cannot stop one of the front wheels turning, as you should with a fully functioning differential. I am in on any potential class action. Your insight into the Diff being different has been discussed, but nobody seems knowledgeable enough to be able to push this theory forward. If possible could you post more details on GLCForums.com about the the Diff not functioning / wheels failing to stop. This would be very interesting and might just be the start of identifying the true cause of the crabbing and juddering fault. It is not our responsibility to try to come up with explanations why Mb have produceda a vehicle with this fault . Interesting. I re-test drove the 250d AMG on 20 inch Pirelli Scorpion Verde tyres a few weeks ago. I zig zagged backwards and forwards in a car park on full lock for ages at a wet outside tremperature of about 3 degrees and the car was fine. The car had been used so may have been a bit warmed up, would this be a problem? There was an incredibly subtle jump (I mean really so minor it was of no signifcance and I only noticed it because I was listening for something because of this, otherwise it wouldn't have occurred to me) which only occured one in every ten times when I sharply went from full lock one side to full lock the other and only in one direction (I can't remember which). This was not enough to have bothered me. Are these Pirelli Scorpion Verdes the new tyres MB is referring to or are they the ones everyone is having problems with? This is a car registered in Dec 16. Is this because the car may have been a bit warmer because the outside temperature was 2-3 degrees. Please anybody let me know asap if these are the problem tyres or not as they are listed online as all weather tyres. If this is true they may have helped I don't know. Your help is appreciated as I'm thinking of buying the car. I have 20" Pirelli Scorpion Verde MO tyres and the skipping is very pronounced sometimes when the temperature is above 7 degrees. Has anyone actually had the All Season tyres fitted? If so, has this cured the skipping? It would be good to get feedback on the tyre switch. I've postponed my purchase. Shame, the car is such a lovely cruiser and looks amazing on 20s with the Night Package. Also quite good value given all you get with Premium Plus (now comparing it to an new Audi Q5). I was really looking forward to it. Please include me in the class action. I'm in the same position with my GLC 250d AMG Line Premium Plus Coupe. I received it pre spec'd with 20" wheels and standard MO tyres fitted when they should have been MOE run flats, I noticed crabing in the colder weather. I raised the issue of run flats not being fitted and eventually persuaded them to fit them as had been agreed at point of sale. Unfortunately run flats weren't available for the larger 285 20" rear wheels, eventually I persuaded them to replace my 20" wheels with the night pack 19" wheels from their demo GLC Coupe which they did with run flats fitted. On the run flats the crabbing disappeared though I'm not sure if it was the tyres or the increase in ambient temp to double figures or a combination of both. I've since noticed in the wet during full lock manouvers the front wheels skid which has made me realise the crabbing is still present but mainly in the wet. I've owned a number of higher performance cars with 21" wheels fitted with low profile tyres without any sign of crabbing. I too have this problem on my GLC43. It is not acceptable in 2017 for a premium manufacturer such as Mercedes to release cars with this fault. Very embarrassing in car parks and with passengers. Only happens on full lock in tight spaces. Been to the Mercedes dealer where the car was purchased but they would not accept it as a problem and there ld me to contact Mercedes UK directly. Not the first time I have problems with a new Mercedes either. Your contract is directly with the dealer who sold you the car it's a cop out them sending you to Mercedes. I'd ask them why LHD GLC's don't do it and RHD do, wouldn't this make it a design fault with RHD models. If it's not a problem then request they make your GLC drive the same as a LHD model. I received my GLC43AMG on the 4th of January 17 I drove it from their 20+ degree showroom in Gloucestershire. immediately I noticed the skipping problem with what they proceeded fob me of with the same old story. Eventually after 17 days and a near incident with the car stepping sideways on a tight cornerI returned it with a letter of Rejection the V5 and the keys. They have since then not accepted my rights which are covered by the consumer credit act 2015. I have now had quite enough of them trying to pacify their customers with BS like Waivers New tyres etc I would like to see MB address the real problem with this fault. I have now handed the the case over to my lawyers. I am now in contact with other GLC owners with the same problem. I find it such a shame that MB can get it so wrong on what could be a fabulous vehicle. they have lost us as customers for good. I will keep you all posted on my progress. If anyone has a DEKRA report done (£200) which MB are stating is one of the independent bodies who confirm this car is safe (yet produce no documentation to support this claim) please be aware the Motoring Ombudsman receives a £20 referral fee (see the website) and Mercedes-Benz partner for their bus/public vehicle section is DEKRA and DEKRA also sponsor Mercedes touring motorsport cars.....make sure you are fully informed. If you need an independent report look up an engineer on IAEA website. It drags on and on and on and you may get your car back with all four wheels the same size tyres, not as you ordered (coupe) to try to reduce the characteristic to a level which satisfies your "personal preference". I don't want a £49k car with a comfort issue. There are many lost sales through this appalling handling of this design fault and what is in effect a recall of vehicles. DVSA are still investigating, so the safety statement issued by MB is a bit premature me thinks. Yes it does seem to drag on and on. I have placed the matter in the hands of my solicitors but the initial response from the dealer's solicitor is that there is no breach of the Consumer Rights Act as there is no "fault" with the vehicle. Much as expected they refuse to accept rejection of the car.. I am considering obtaining a DEKRA report but given the above maybe that's not such a good idea. If anyone has had one done it would be interesting to know what they have said. I'm not a solicitor but my response to MB's solicitor would have been if there's no fault why don't LHD GLC's do it. The very fact that crabbing exists RHD GLC's and not LHD indicates there is in fact a design fault on RHD GLC's. I had a DEKRA one done on my behalf via lloyds bank and have advised Lloyds to get a refund. Basics such as tyre pressures were not recorded and the mechanic towed the MB party line saying winter tyres will fix the fault...which we all know is rubbish. He did advise the dealer should provide these free as a gesture of goodwill given the age and price of the vehicle, but they refused ( not for the first time) and they refused verbally to my solicitor. Ironically I asked for all season tyres at the beginning of December 2016, within a week of delivery as I was unaware of all the crabbing/geometry threads on the internet. My dealer refused this as well, in fact they have offered a big fat nothing to try to solve this despite returning the car to me twice within two weeks saying they have fixed it. They are absolutely diabolical. I'm sure you are aware my car was rejected under the 2015 act. I don't know why we are all trying to prove a fault, the Act states "satisfactory quality in relation to price paid" which the dealers solicitor is ignoring. A comfort issue on a luxury car (or any new car) is not acceptable and is the reason for rejection. Mine has been taken to MB HQ and has been sat there for a month whilst I borrow a family members car. The dealer hasn't offered a loan car or anything to maintain customer confidence. I know of at least three people who have decided against a MB purchase from the way I've been treated. Hopefully DVSA have more clout. Anyone who has paid a deposit, please make sure you are 100% confident you have done your homework before taking delivery. It's interesting as it's classed as a characteristic of the vehicle. I have recently taken delivery of a 250d Sport, air and off road package and it does not have this characteristic. I get the odd one if I really push hard lock and fast turn. I was called on 28th Feb with the offer of all season tyres, I accepted the offer and was told that my nominated dealership (Swindon) would contact me for the fitting in 1-2 weeks. 4 weeks have passed so I called Swindon today to find out if they had my tyres in stock... turns out they have no knowledge of this program to retrofit all-season tyres to GLC models. I suggested they contact their head office to find out what the right hand is doing while the left hand has its eyes shut. This fiasco seems never-ending. Did anyone successfully get their all-season tyres retrofitted yet and if so what was the dealership? contact, adrianbressing@abfamilylaw.com who will gladly assist you. I was called by Mercedes Benz UK earlier this year and told that they "will expect to have sourced replacement tyres early April..."
Finally got the tyres replaced on my GLC250d. They replaced the 255/45/20 Pirelli Skorpion Verde with Vredestein Quatrac 5 and inflated them to 2.5bar all-round. The steering feels slightly (but noticeably) heavier and there's less tyre noise (both of which are welcome improvements in my opinion)... but more importantly, no tyre skip that I can detect. Will need more time and more temperature/weather variation to know for sure but it's a positive upgrade so far. I have a mercedes GLC registered Nov.26 2016 with 12000 miles on the clock, it has been crabbing from new all the dealer Sinclair Bridgend South Wales has said is to change the tyres for winter tryes. I feel this is totally unacceptable and after seeing so many others with the same problem I would wish to join the class action. I am also finding this on my C45, that I got 2 weeks back, it's really very bad indeed. I am just to speak to the dealer. I am also only about 20mins from mercedes world, so will also be going there to their services team to discuss. Please include me in any further action. Dave s £50 grand GLC 350 coup ,shocked at the way it drives crabbing at every 90 degree corner.Dealer said they will replace tyres with allseason ones .mb surely must come up with a better solution. Please include me in any further information or action. There are a lot of people who have experienced the fault over the past 15 months...with many waiting for new tyres to fix the problem...how did folk get on with the new tyres? Hi, About to get new tyres, will this fix the problem? Is there a class action? Same issues with my GLC250, booked in with MB again this Friday, count me in. Received my new GLC43 in October when the temperatures were still decent so didn't notice this as an issue but has since become a big problem and i have subsequently found all these sites with so many people affected. I just don't accept that this isnt a safety issue as it happens even when turning in to regular side streets. Have contacted original dealership, sales guy very sympathetic but ran through Mercedes compay line and arranged for me to get a new set of all weather tyres which he said would fix it, until i pointed out that they delivered the vehicle with all weather tyres fitted. I'm still booked in for them to look at it but tbh i don't know why i'm going up there and don't expect anything to happen. I asked about my rights for a refund but have been met with silence. £50k for a new car that i don't feel safe in or want to drive. It's truly shocking how mercedes benz are (not) dealing with this. Yes please sign me up for any class action suit now or in future, i want my money back. My dear friend pre-ordered a brand new Mercedes SLC from Mercedes-Benz of Ashford, when she picked it up she soon noticed that the bumper was badly damaged, but they had used filler and black spray to cover up the damage (really poor job too), there was over spray in the headlights and in the seems, and looked awful. This was supposed to be a brand new pre-ordered car! They agreed that there was damage and sent away for a new bumper. But the car seems to be more damaged than just the bumper! The car is only getting 3400 miles per set of tyres, my friend is a 66 year old lady that does not drive like a lunatic. She has always managed to do 22,000+ miles on tyres on very similar cars (slk's). We have been complaining about this for over 6 months now. We raised a case with The Motor Ombudsman 5 months ago, and the only reply we have had is a sorry email, they are sorry that the guy that was dealing with our complain had left the organisation, and he had not escalated our complaint properly. This was a month ago and still nothing. Mercedes-Benz of Ashford have been saying for 6 months that the car is perfect, it must be how my friend drives. But it has now come to light that at no point have they checked the alignment. They have now done so, and it was 'out'. Which caused premature tread wear. We believe this is because the car was in an accident before it was handed over. Mercedes have offered a refund for a set of tyres! poor customer care!! The car is dangerous!! I’ve had a GLC since March 2016 and have been complaining to my dealer even since noticing the crabbing/skipping which gets really bad when the temperature drops. However, Merc Bromley called me to say they are changing the tyres free of charge and I’m so pleased to say I drove it this morning for the first time (7•c) and NO skipping! I’m amazed! It’s such a relief as I love the car apart from this fault. So I urge you all to seek a change of tyres to Michelin Cross Climate SUV tyres. Fingers crossed it lasts. Yes we would like to partake as well... absolutely shocking noise coming form our GLC. Going to look at the new Volvo XC on Sunday. I'm new here and trying to find intel/info to support my case. I have a E43 AMG estate with horrible crabbing. Long story short. Mercedes first offered to swap tires but then backtracked as apparently 'tires are out' and just called it a 'characteristic of the car' which of course is total rubbish. I have already sent the dealership a consumers rights letter and am now going to push to the ombudsman, but reading the threads here does not give me a sense that any class act suit is being planned or organized. Seems that this site died down a bit around Feb/March 2017? I could be wrong and I hope I am, but I plan to take this all the way. Worst part for me was the fact that the dealership initially acknowledged up front that the crabbing was particularly bad on our car. It has only done 3000 miles. I also spoke to a very rude Ross Stevenson from the UK AMG team. He sounded like a broken record and just insisted that nothing was wrong with the car. This is the first and last mercedes I will ever own. Well I bought one of the new E class All Terrain 4wd in December. The noise when manoevering is TERRIBLE. This is a new model of course, only available in the UK in Dec 17. You might have thought that Mercedes would have solved the problem before they launched a new 4wd model but obviously not. The problem of course is that the diff ratio isn't properly set up / engineered. I'd be interested to hear from anyone else with this problem with the All Terrain. I Have a GLA 220 which has the "crabbing" mentioned. I have just changed the Front tyres thinking that was causing my problem, as I also noticed the outside of both front tyres were worn bold. The new high grade tyres have made no difference and it was then that somebody mention "crabbing" problems with some Merc models. Does anyone else have a GLA with this problem? GLC coupe 67 reg with 20” alloys. I have now received an update about the problem of juddering. DVSA and DEKRA inspected these cars in March 2017 due to high complaints from customers. It would appear the they convinced by MB that’s its Chararistic of this model, unlike any other MB or car on U.K. roads. I would suggest that MB knowingly failed to notify customers of an issue that would harm their reputation. I bought mine in September 2017, so 6 months is enough notice to make any changes or inspections to model effected, yet nothing seems to be completed to mine begore I collected it. I have made arrangements at 2 different dealers to get the car inspected and yet 4 times the appointments and courtesy car details haven lost by MB resolutions and so they are saying I’ve never complained. Yet I have the information and won’t speak with the salesman or service person I have dealt with. And they are refusing to investigate fully. I have tried to reject the car under the sales of goods act - yet MB aren’t interested and so I’ve contacted Trading Standards and Motor Ombudsman as I have taken all reasonable steps to resolve the problems. I have the same issue - bought my GLC 250D AMG Line in July 2016 and the crabbing has become increasingly worse over time. My near side from tyre is now completely bald on the outer edge. Please add me to the list also. We brought our GLC350 in JUNE 17 and it is a terrible ordeal. This is not crabbing, the car actually “skips” god awful sound that’s can’t be doing any good to the car or tyres for that matter. I have read so many of these but to no avail! I would be interested in hearing any success stories where MB have accepted the vehicle back. It’s almost embarrassing cold weather is worse but it’s there consistently. Please add me to the list also. We bought our GLC 250d AMG on 20" wheels 10 days ago....noticed the juddering Sunday & today.Contacted supplying dealer MB Southend and was told is known problem. They have booked car into our local dealer next Tuesday for full check on alignment and possibly to fit winter tryes. I have just found this thread & am totally appalled. Am considering lawyer to get car rejected and refund. I would like to join a class action also against the defects on my GLC 250 D ,I was told to sign a waiver form at the mercedes garage but wasn't show what the fault was or how it affected the car . Have a 2017 C300, 14000 miles and new front tyres needed , car also crabs / slips at low speed on full lock. Add me to the list, car going into Merc next week, we'll see what they report!! I was about to purchase a GLC coupe and came across this thread. Really shocking. The arrogance of dealers is what's really irritating and lack of concern for customers. Will stick to my BMW 520. I've emailed the dealer to tell him why I'm not proceeding - they probably won't care, some other mug will come along soon. Good luck with getting this sorted. I purchased a new E63 Amg from STRATSTONE Glasgow. This car has crabbing badly when I contacted them got a load of excuses. They say they can't do anything about it. If I had known about this issue before I purchased would have walked away. I reported my car to the dealership who acknowledged that the GLC has this problem as you have all mentioned above. Thankfully after checking it for themselves, they agreed to change the original tyres to all-weather ones at their expense, and it has completely solved the original problem. It’s a real pity that you have not been given the same courtesy, respect and customer service that one should rightly expect. I have the same problems. AMG C43 purchased new in July 17, it has just been in for its first service and both front tyres are that worn they are illegal (rear tyres are at 5.4mm) Car has only covered 5000 miles but the dealer says that this is normal for this kind of vehicle. Is this still happening on 2018 models? we are currently looking at them, and after a test drive this morning was quite impressed with it. Please add my name to class action After 6000 km Merc replaced tyres with Michelin and same problem, Michelin have check car and confirm not tyre problem.I have loged two complaints with Merc only generic reply.Yet Merc continue to sell the GLC coupe unbelievable!!! The dealership seems to argeu that crabbing normal? Include me in this. Just purchased a C43 and have exactly the same issue. It may well be a characteristic of the model as i am being told, but that doesn't mean it's fit for purpose. The least MB should do is to explain the problem before purchase as a test drive would very rarely flag this issue up. I'm having the same issue, Dealership has offered new "winter wheels" and keep my so called "summer wheels" WTF are they on about, the other alloys offered are different to the spec I ordered for the car, so why should I have to accept this, and also have to swap wheels twice a year and store the unused set. I'm on 255x45x20 front and 285x40x20 rear, they can't get all season in this size apparently, so want to offer 265 front and 295 rear. I've told them if they cannot fix it by adding all season tyres to my current rims I want a full refund as the car isn't fit for purpose. I'm awaiting the GM/s response this week. She told me if I experience any problems I can bring car back as she is confident it does not have the issue. Low and behold a month of having it, it’s crabbing and skipping. What a SAFETY ISSUE !!! I am now trying to liaise with Mercedes and they are ignoring all my emails and attempt to communicate. I have replied several times on another page with Honest John. I too have a GLC350d AMG Line and told the MB dealer (Coventry) that I had read the stories and they assured me that I would have no problems because they knew of the problem (although they did not tell me until after I had paid the deposit and told them I knew) and were fitting all weather tires. I bought the car in March 18 and have done 14,000 miles so far and have not had the crabbing at all and there is plenty of tread left, I am expecting at least 22,000 out of them. The tires fitted are VREDESTEIN QUATRAC 5 255/45 R20 they are all weather and run-flat. I have had an issue with the dealer and got a lousy response from them which is what I had expected so no suprise there. The motoring press must know about this yet seem very silent about it, maybe a case of don't bite the hand that feeds you. Good luck. From Sydney Australia. I have a C43 Coupe that has now travelled 25,000km. I have had this problem since new and it annoys me considerably. Dealer has said it is "normal", indictzing it is just a tyre problem. I say there is nothing normal about this, it is just BAD BAD BAD for what is otherwise quite a good car. I've asked the dealer to escalate to MB Australia. Lets see what they come back with.. Purchased brand new AMG 43 GLC in August 2018 it is fitted with 21-inch alloys with Dunlop tyres. Serious crabbing and not just when cold. It is interesting that most previous posts mention fitting winter tyres to alleviate the problem. I have been advised by MB customer services manager in the Netherlands that Continental 5* summer tyres should have been fitted on the front axle at the factory. When I questioned about the rear tyres he told me that the Dunlops were fine and they will not be changed. Surely this is just making handling worse having two different compound tyres on a 4matic vehicle. My E43 (2018) has the symptoms as above, Mercedes have changed to 19 inch lower spec alloys and winter tyres. I paid extra for 20 inch diamond cut alloys which have been made redundant and the car has lost its look. Is there any help to resolve this matter.? I have had a 250 petrol amg line delivered end of july 2018 with 20 inch wheels and run flat tyres . I have had the skipping problem and in the ice and snow on full lock the car tends to go straight on under braking when coming to a stop. I complained to MB uk customer services who contacted the dealer who agreed to fit modified steering knuckles. Which I understand are available now to order by the dealers. The skipping problem is now non existent. Make sure your dealer does an alignment check after fitting obvious to me but the dealer was a bit reluctant but eventually admitted that many sections of the steering had to be taken off to fit new knuckles. Just replaced all 4 tryres on my C43 and now having a problem with crabbing which i didnt before, I blamed myself as I changed from run flats to non runflats. Having read several forums this seems to bee a design fault. I purchased an E 43 Estate March 2018 from a dealer in Sheffield, it's been back to my local dealer (not the one I bought it from) several times because of this problem, all I get is MB recommend replacing the tyres. The cars only done 8k and the tyres all have 6mm of tread left. the problem was particularly bad when we those icy conditions back in January,trying to get out of a car park it didn't want to turn. Told to put summer tyres on. In January? How does that work, what sort of response would I get from my insurance company if I had a mishap? Apart from this I love the car but add my name to this action please. How is the action going? MB UK is now fitting under warranty New Steering Knuckle components for GLC owners - except C43 & C63 variants. Recently had the new parts fitted to our 250d on 20" wheels, and it appears to have resolved the problem. So no crabbing fault = happy customer. It has taken MB HQ over 3 years to accept they had a major issue with Crabbing and Clonking on the Right-Hand drive GLC's. They initially ignored to fault hoping it would go away, then fitted FOC replacement All Weather Tyres, which helped mask the problem, but it was still evident. The new steering components appear to have fixed the problem and also made the steering more precise with the added bonus of reduced tyre wear. If you have a GLC call your dealer and get the parts fitted!